Last week I told you that this year’s Tea for Stewart raised the fantastic sum of 1456 quids. Brilliant, or what? On Monday of this week Mrs G and I went down to the local bank to put this money in. Until that point Mrs G had been carrying this large sum of dosh about in her handbag. She was absolutely petrified that somebody might mug her while she was carting this about. Actually, she looked rather shifty the way she was clutching her bag every time anyone got remotely close. It was a wonder she wasn’t challenged by a policeman suspecting her of being in possession of drugs. Any road up, she felt relieved when she finally reached the bank. She began handing over the bags containing notes and coins. Tell me something... When you give to charity, do you give a fixed amount? Say, £20? Or do you just empty your pockets of all the loose change you might have? Some of you will answer yes to the former; some will answer yes to the second. Correct? Yes? Why do I ask? Well, a bag containing 26 quid of the amount I quoted consisted of a mixture of coins - pennies, 2 pees, 5 pees, 10 pees, 20 etc. Obviously, this was money that people had simply emptied out of their pockets. Mrs G handed this bag full of change to the cashier and was told, rather abruptly, that she couldn’t accept it. At this point in the proceedings you made have heard my anguished cry of ARRRGH! from the other end of the shopping mall. I felt the ghost of Victoria Wood was at large and I was in the middle of one of her sketches. Have you ever heard of anything so daft? A bank that doesn’t want your money? What is going on? We relented and gave her the money we had that was bagged correctly and put the £26 mix of coins back into a bag to deposit at a later time when it was converted into acceptable coinage. Guess what she did with the bags of coins we did give her. She put the bags onto a special set of scales to weigh them. Now, the way [Weigh? - Ed.] she did this was to set the scales by selecting the correct coin and the readout told her whether the amount was that specified on the bag or was too much or too little. Are you thinking what I’m thinking? I am thinking, if it is that blibbing easy to count the money, why the hell did this jobsworth of a bank cashier waste ten minutes telling us we couldn’t put odd quantities of coins in. All she had to do was take each denomination of coin and weigh it. She didn’t even have to count it. The answer was there on a readout. As I said earlier... ARRRGH! Please visit The Grambler’s Kick Cancer’s Backside Fund JustGiving page (https://www.justgiving.com/fundraising/Geraldine-Smith3) and you will be able to see that, since we began the fund, over £32,000 has been donated to the Bobby Moore Fund. We will continue to raise money for this wonderful cause in the hope that one day a cure can be found for the horrible, horrible disease of bowel cancer. *That joke was first used on The Frost Report back in 1966. Let’s move on to grambling matters. What happened last week? Nothing. We didn’t have a bet. All right, what happened the week before last? We won. Only kidding. We lost. Well, a bit of both. We won 82 pees which means we actually lost £1.38. Not too good, eh? ‘Each Club will play one game at home and the other away against the two clubs drawn immediately below it in the group. Club 1 plays Club 2 at home and Club 3 away; Club 2 plays Club 3 at home and Club 4 away and so on. This criteria is circular so that the Clubs “immediately below” Club 5 are Club 1 and Club 2 in that order. This mechanism will ensure that each Club will play four games in the Group (two at home and two away). There you are. How simple is that? [My brain hurts. - Ed.] Who on earth dreamed that up? It is pointed out that this system is based on a model used for the UEFA Cup. What isn’t stated is whether it was ever used a second time. Considering the amount of money I had to fork out, that is not very whopping at all. Teaser time. Yay! Two weeks ago I asked you which player at the Euro 2016 Finals had accrued the same number of caps as Plastic Man aka Ronaldo? The answer was Republic of Ireland’s Shay Given. Did you get that one? Yes, perhaps a bit too easy. What about one for this week? In a 1990 World Cup game between England and Ireland, what did Gary Lineker do that was very unusual? Try that one down the pub. Answer next week. And finally, Cyril? And finally Esther, I am indebted to the fine ladies and gentlemen of the Independent newspaper. As you may be aware, our esteemed Prime Minister Mrs Theresa May (or may not) has seen fit to appoint a certain Mr B. Johnson to the post of Foreign Secretary. Now, to me and many others, this is perhaps not the wisest of decisions given old Boris’s penchant for upsetting a few people. When it comes to offending other nations, Boris is up there with the top man, Phil the Greek or Chookie Embra as we know him round these parts. 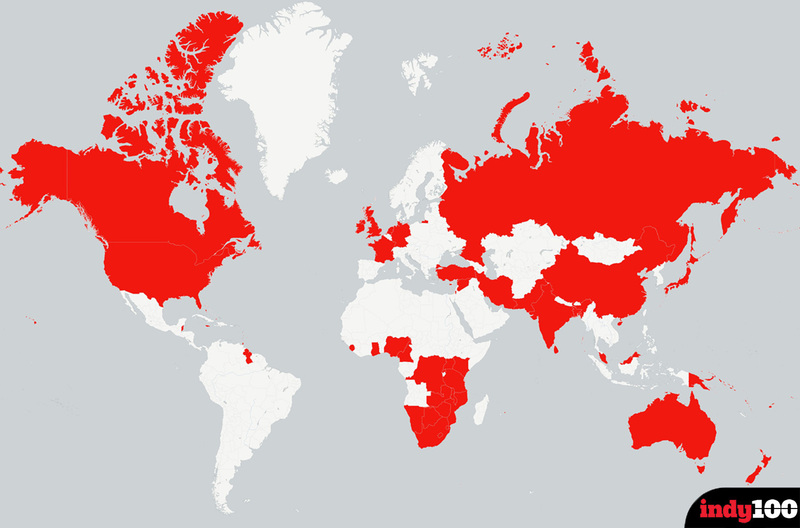 So here, ladeez and genellum, is an up-to-date map showing those countries Boris has (so far) offended. Be aware that there may be more red on the map once he has made a few visits abroad in his new role.